Work in progress at the ACR site. Tech Group, the largest construction group in Ajman, says it has secured contracts worth a total of Dh87 million ($23.7 million) to provide various construction solutions for the Ajman Corniche Residence (ACR), a mixed-use property development being built in the UAE emirate. The Dh600-million ($163 million) waterfront development, which is scheduled for completion in Q2 2017, comprises seven interlinked towers which will feature a distinctive architectural design and top-of-the-line lifestyle amenities. Expected to become a major landmark along the Ajman coastline, the tallest towers of the 200-m-long complex stand at 47 floors on top of an eight-level podium. Among the contracts awarded to the group is a Dh50-million ($13.6 million) deal, which will be carried out by its electrical and mechanical arm, EM Tech, in what is the largest ongoing MEP (mechanical, electrical and plumbing) project in Ajman. The contract is set to be completed by early 2017. “With the Expo 2020 coming up, there are a lot of opportunities for construction works, not only in Dubai but across the UAE. There have been global construction firms opening their branches in the UAE and we are working aggressively to capture our share despite the cut-throat competition,” he adds. 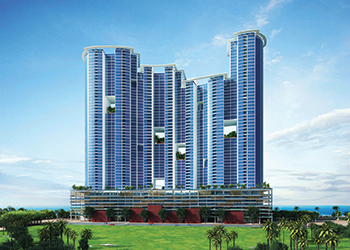 Ajman Corniche Residence ... $24-million orders. Today, the group comprises 10 units offering an array of services to the construction sector ranging from pre-construction and construction services to MEP services. Earlier this year, the company secured a piling works contract for an R-Hotels resort at the Palm Jumeirah in Dubai. Piling Tech, one of the companies under Tech Group, is involved in the piling and foundation works for the resort which is scheduled to be completed by early 2016. “We have secured around Dh65 million ($17.7 million) worth of projects in Dubai over the past five months, and with a new block-making plant under construction, we are looking to add over Dh240 million ($65.3 million) worth of projects across Ajman, to our profile,” Hasan reveals. 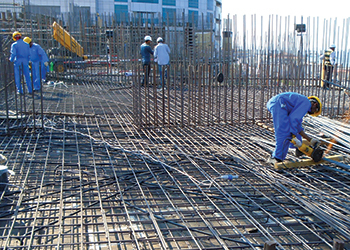 The Tech Group has been involved in numerous projects in Ajman including Ajman One Towers, (blocks, MEP, and piling works); Ajman Pearl Towers (aluminium and glass works, blocks, MEP, piling, readymix concrete, steel cut and bend and fabrication, wood joinery and interiors); Al Zohra Golf Project (MEP); Emirates City (blocks and readymix concrete); Orient Towers (aluminium and glass works, blocks, MEP, piling, readymix concrete, steel cut and bend and fabrication, wood joinery and interiors); Paradise Lake Towers and R Tower (aluminium and glass works, blocks, MEP, piling, readymix concrete, steel cut and bend and fabrication, wood joinery and interiors) and Ramada Hotel (aluminium and glass, and blocks). The company has provided wood and interior works for other projects such as the Al Zahra Hospital in Sharjah; Jumeirah Lake Towers and Marina 101 Tower in Dubai; and Sheikh Zayed Mosque in Abu Dhabi, all in the UAE; Amiri Terminal, Kuwait International Airport, Kuwait City; and Doha Bank headquarters, and Naqi Hotel, both in Doha, Qatar. The company has recently been through a management change, following which the year 2014 was dedicated to consolidating operations and businesses across the GCC. “Since that has been done, we have seen growth during the first quarter of 2015 which is almost equivalent to last year’s first two quarters. So business is growing, which gives us an opportunity to tap different markets. With more than 50 small and large projects under way in the Northern Emirates and the potential of bigger markets like Dubai and Abu Dhabi, this year will see Tech Group grow even bigger with a target of Dh1-billion ($272.26 million) in business transactions. “Investing in state-of-the-art machinery and skilled workforce has enabled the company to gain an edge over competitors,” Hasan says. Tech Group’s 10 business units are spread across the UAE, each with its owned asset base and individual expertise to provide complete one-stop construction solutions, including AluGlass Tech for windows, door, walls and partitions; Block Tech for concrete and paving blocks; Diesel Tech for petroleum trading; EM Tech for MEP works; Hi-Construction Tech for pre-construction and construction services; Piling Tech for foundation engineering; Remix Tech for readymix concrete products and waterproofing; SteelFab Tech for steel fabrication and reinforcement steel; Trans Tech, a truck and trailer specialist; and Wood Tech for interior designing, doors and joinery works. “Most of the business units are ISO certified, which is a testament to our unwavering commitment to apply quality management systems across the group,” concludes Hasan.